Bonjour lecteurs! Another day in our Blog Anniversary Giveaways. After featuring Botley the Coding Robot (you can win one!) we are now back with Sweet & Nostalgic. I love decorating the house with diverse objects and you? If it is the case, then you will definitely love this. 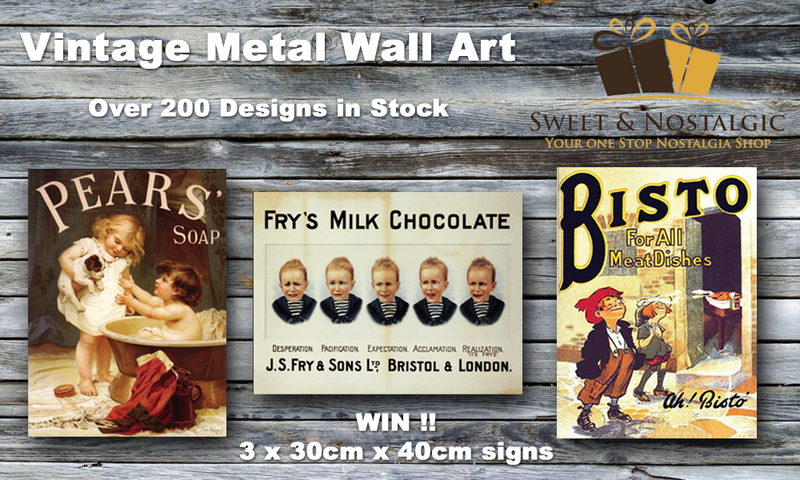 Win a Lot of Sweet & Nostalgic Vintage Metal Wall Signs worth £35. See you tomorrow for another fab prize! You will be in to get some gorgeous earrings with les Georgettes! Loving something different or a bit vintage? Sweet & Nostalgic is your place. Retro gifts, birthday presents or personalised items, it’s full of objects from another era and it will make you feel nostalgic for sure! Based in South Wales, this family business does not only sell kitchen storage tins. If you fancy a bit of sweet, try their selection of traditional candies! But for today, it is not some food we are offering. Non! It’s all about decorating the house! Made of 3 Metal Wall Arts, our prize is going to send you back in the past for sure! They are all featuring children from another time and might actually remind you of your childhood! Available in different sizes, this is a best seller of the brand. Did you know? 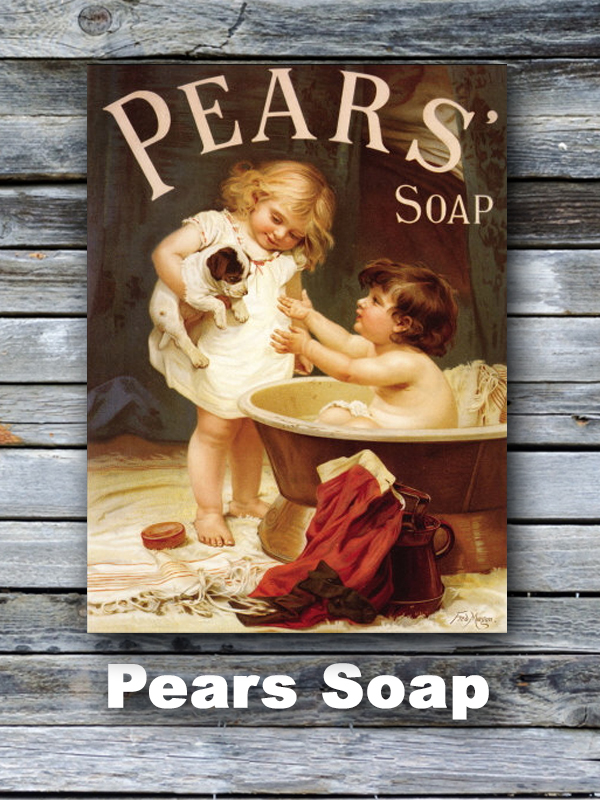 Pears transparent soap is a brand that first sold in 1789 in Oxford Street. It was the world’s first transparent soap! This nostalgic sign is parfait for your bathroom with its sweet vintage-styled design. Coming with pre-drilled holes in each corner for easy fixing, it will be quick to transform your interior with this emblematic brand! Je pense que this metal wall sign is my favourite in the lot. If you are a parent then you must know too well the faces that this little boy is making! I also like his outfit. So traditionnel! And I love fashion, you know it! 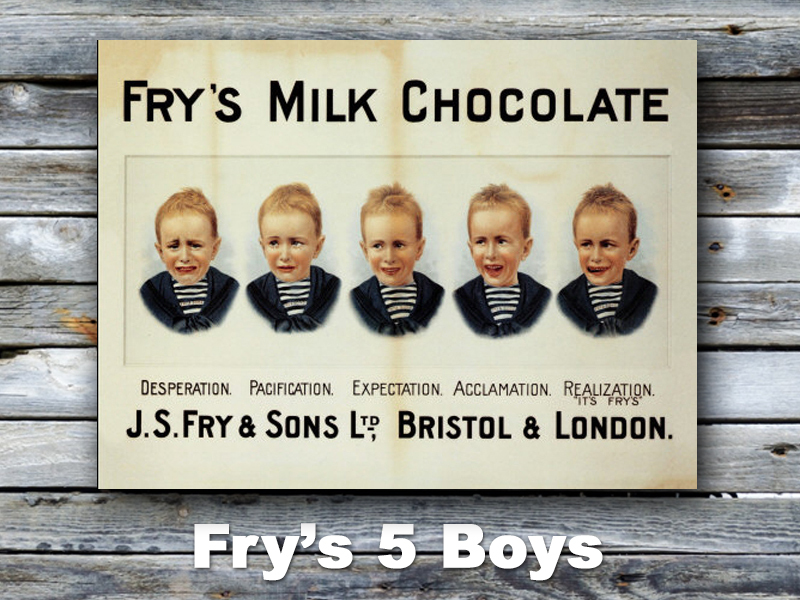 This nostalgic advertising sign dates from the late Victorian era and makes me feel like having some chocolate right now, pas vous? 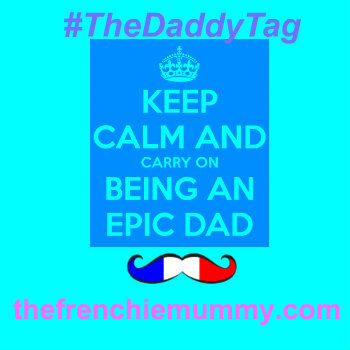 And last but not least, un classique! 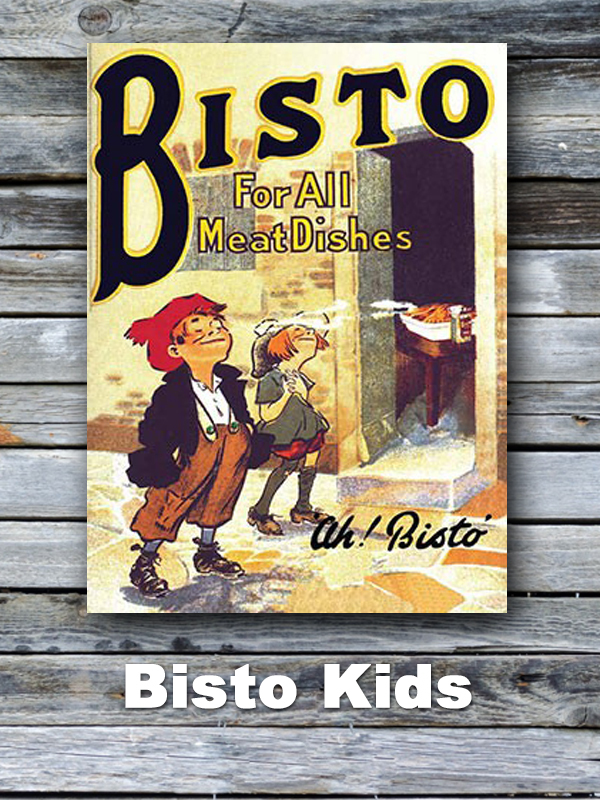 Who doesn’t know Bisto? This reminds me of Baba as he is a real gourmet and likes eating food. If I didn’t stop him, he will be at it all day long! The Bisto Kids featured on this sign were also part of more elaborate advertising campaigns in later years. Idéal dans la cuisine, no doubt this will make you feel nostalgic! Did you get nostalgic while reading this post? Or would you like some sweet Vintage Metal Wall Signs to put in the house? This giveaway starts on Tuesday 15th May at 6 pm and ends at midnight on the 15th June. The competition is open to UK entrants only. Entrants must be age 18 or over. We will select a winner at random using Gleam. The winner must respond within 5 days of receiving the email to claim their prize or we will select a new winner. Merci for reading our new post from our Blog Anniversary Giveaways, Win a Lot of Sweet & Nostalgic Vintage Metal Wall Signs worth £35! Loving what you see? Why not check out our Giveaways‘ section for more fabulous prizes to win with us! See you tomorrow with Les Georgettes! Disclosure: This is a collaborative post with Sweet & Nostalgic. Cadburys – the answer to every question is always chocolate! LOL! I’d probably go with Heinz. got to be Bisto gravy aaaahhh! Heinz! Can’t live without it! It has to be Cadbury! Zoflora is my all-time favourite ? I,d have to say Cow and Gate…. I don’t know if I have a favourite brand, there are so many good ones from the past but now there are so many green brands available. I don’t think I really have one tbh. A lot of the brands that I grew up with, I don’t agree with ethically now and a lot of the brands that I use, I don’t think have been around long enough to be considered “household names”. Having said that, the Pears soap sign would be really special to me. Pears soap always reminds me of somebody very special that I’ve lost, the look and the smell of it always puts a smile on my face! Simple – their products are great for my skin and I recommend them to everyone! Heniz, never let me down…. Cadbury’s! Like the look of these signs. Fairy liquid: 40 odd years ago my son bought me some for Christmas after seeing the TV advert with the song ‘for hands that do dishes…’ a treasured memory! Ikea. Great furniture for the kids rooms and delicious meatballs too! I like Ariel washing products which are made by Procter and Gamble and I also like Purina cat foods which are made by Nestle. Cadbury’s. we lived near the factory and I had my first taste at 4hrs old when my father rubbed a square of Dairy Milk around my mouth. I licked my lips and never looked back, I still adore milk chocolate.